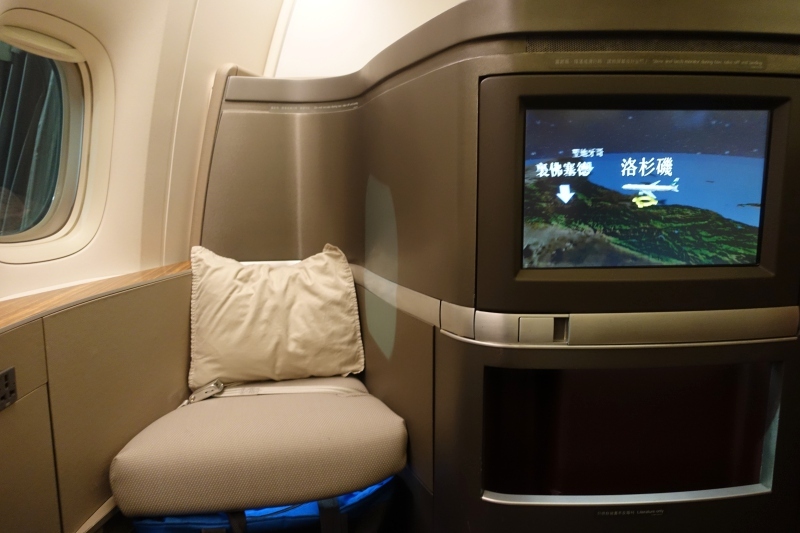 This Cathay Pacific First Class Review on the 777-300ER from Los Angeles LAX to Hong Kong is part of a new trip report including luxury hotel stays in Asia. 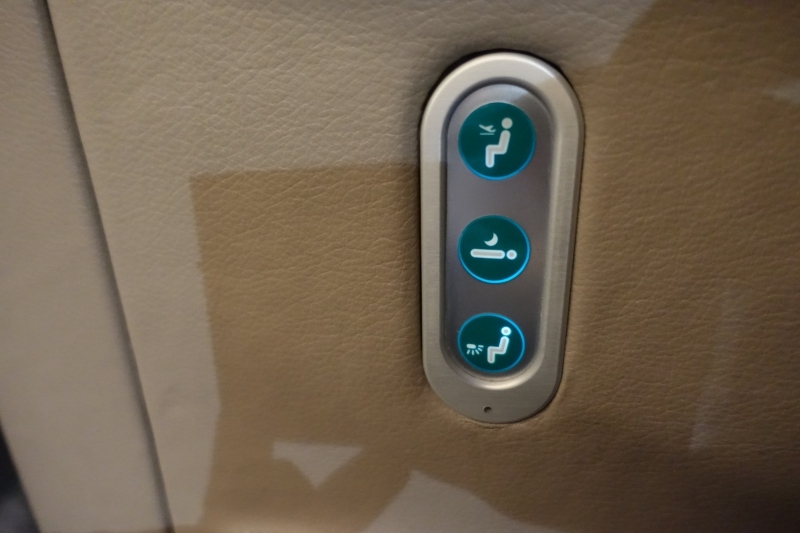 Cathay Pacific's First Class cabin has just 6 seats, which makes it one of the smallest airline first class cabins. 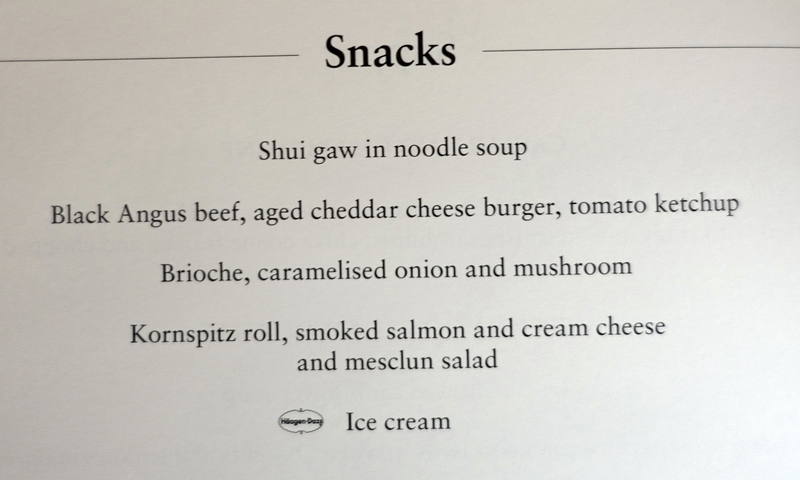 I love this, as I mentioned in Cathay Pacific First Class: 6 Things I Love and 2 That I Don’t, because it often makes for a quieter and more private experience, even though these are open suites. I also appreciate that there are two lavatories for Cathay First Class passengers and crew to use, so you almost never have to wait for one. 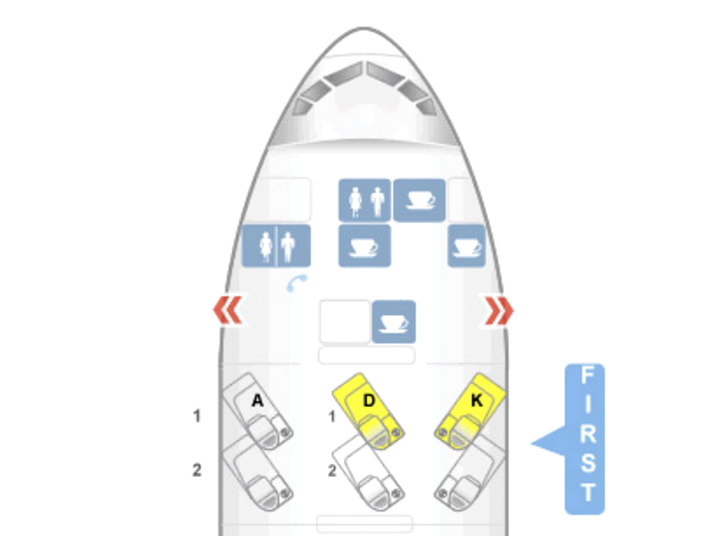 I and most of my clients prefer window seats 1A and 2A on the left hand side, because those are the only seats on that aisle. The other aisle is how you access the other 4 first class seats, 1D, 1K, 2D, and 2K, so it's not quite as private. Since there are no couple seats, sitting one behind the other in 1A and 2A (if you can get awards on the same flight, that is) is a good choice. 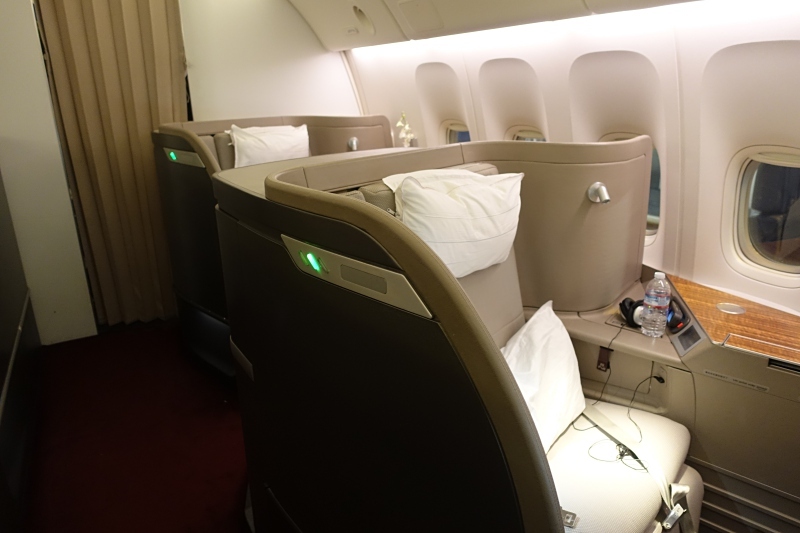 Cathay Pacific's new first class, as of 2013, features more neutral colors, more room in the storage closet, new reading lights and ostensibly better bedding. 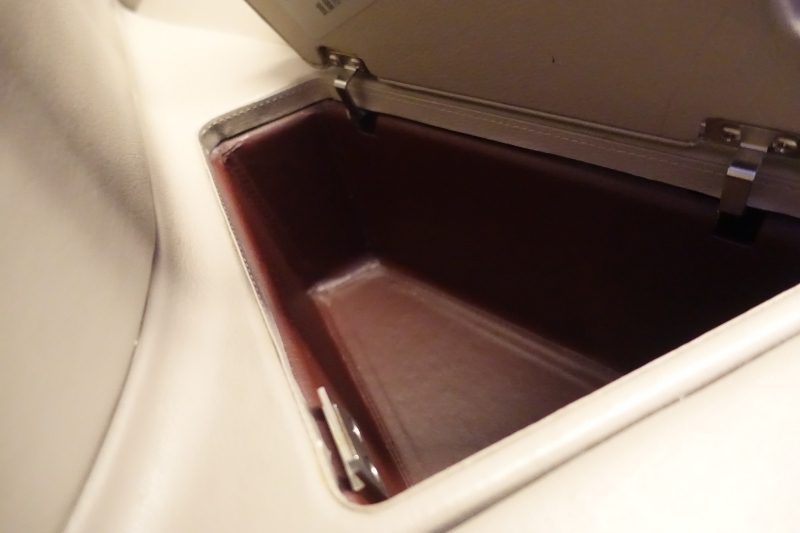 Another thing I love about the Cathay Pacific First Class seat is how wide it is: 36 inches. I was easily able to read to my son back when he was little, and I'll bet he would still fit next to me now in a Cathay Pacific First Class seat, even though he's 8 years old. Two slender adults would even be able to sit side by side, although for dining with a companion, the more comfortable choice is across from each other, since the ottoman has its own seat belt. 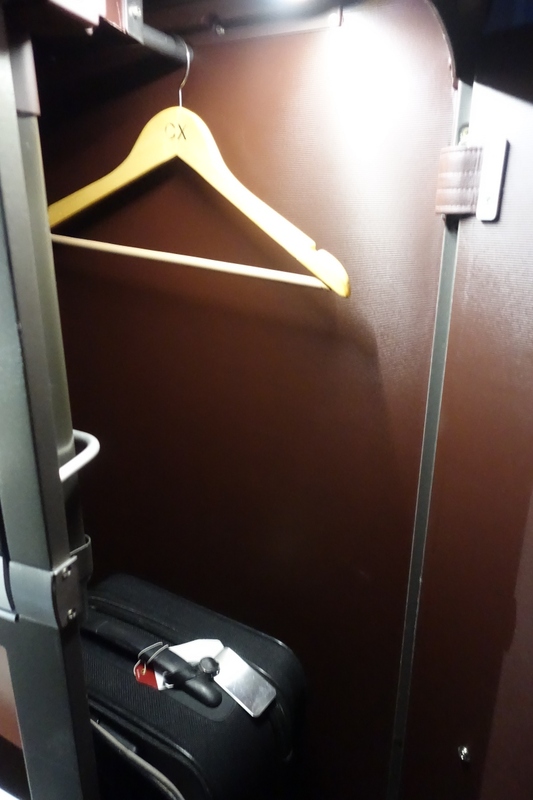 Each first class seat has its own storage closet (since there's no overhead storage) and my rollaboard suitcase fit fine in it. There's also a hanger for those needing to hang a coat. 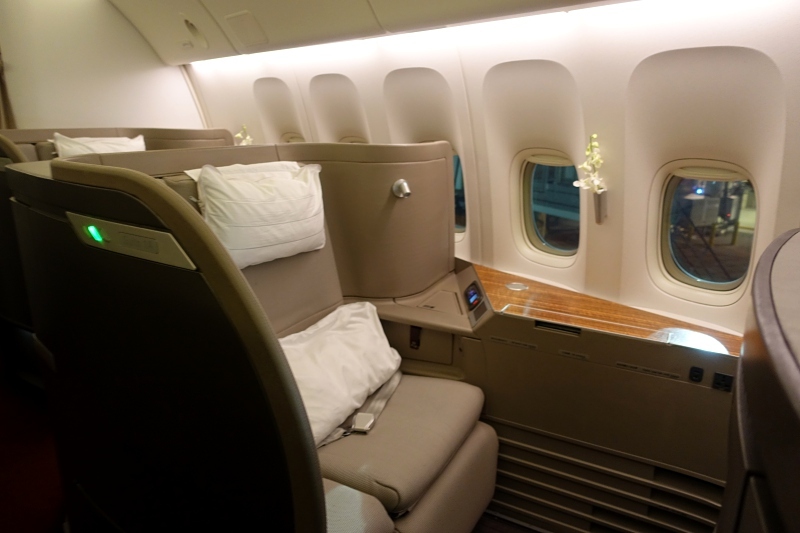 The seat is angled toward the ottoman, since that's what it connects with when it comes time to recline it into a bed, but the IFE screen to the side can be pulled out so as to be directly in front of you. 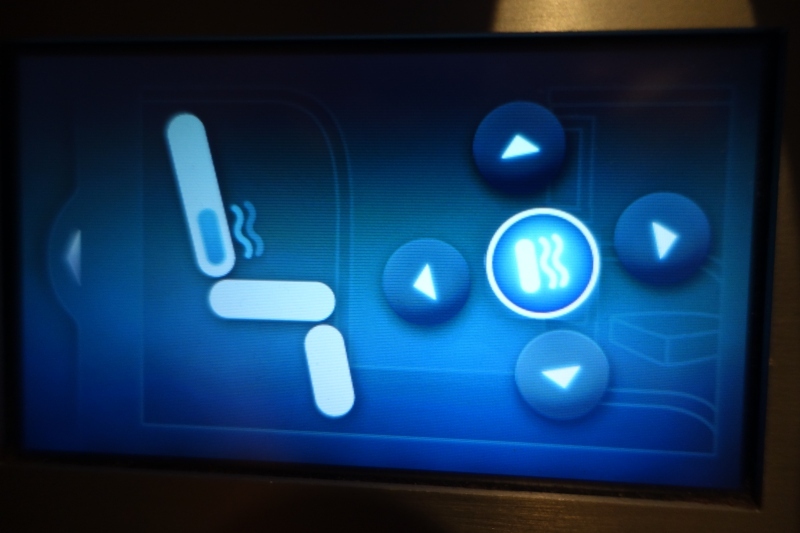 The manual seat controls are simple to use; you can just press the bed button until your seat reclines to your desired position, for lounging, if you don't want to make it fully flat. Via the display, it's also possible to use a seat massage function for your lower back (at least, I was only ever able to get it to work in the lower back area). It's fairly slight though, so I wouldn't get too excited about this function. 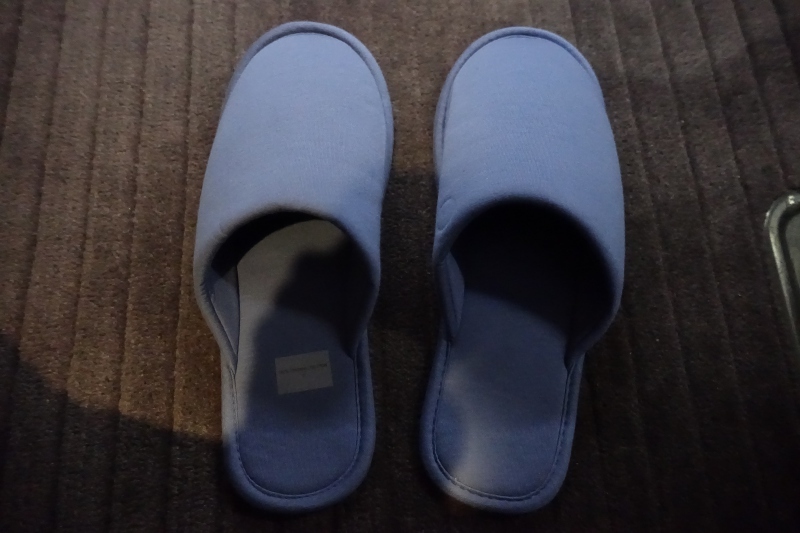 The strongest seat massage functionality I've experienced is in Emirates First Class, but even there, I'd say the pedicure massage seats at my local nail salon are better. 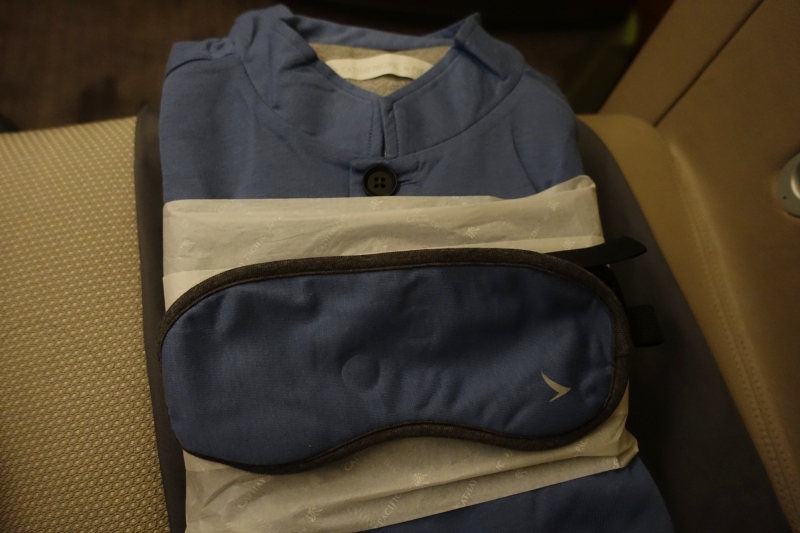 Back in 2013 Cathay Pacific switched from Shanghai Tang to Pye for its First Class pajamas, and I do like the fact that these are organic cotton pajamas. 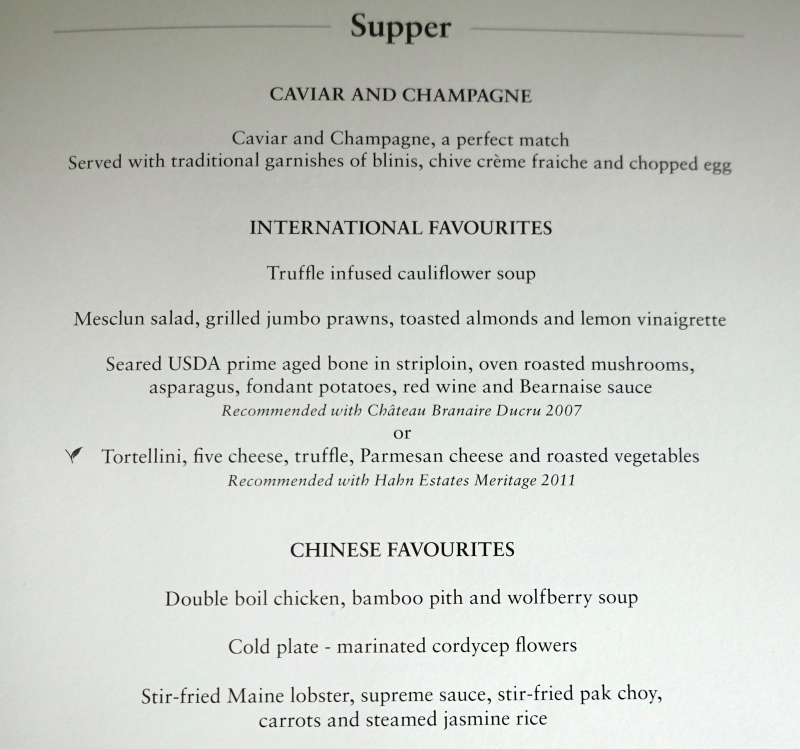 In general I feel there's a dearth of organic offerings, even for airline first class (how about more organic selections in the menus?) so these pajamas are a nice effort, and very soft, even if they do run fairly large (my “small” seemed more sized for a small man, than an average size woman). 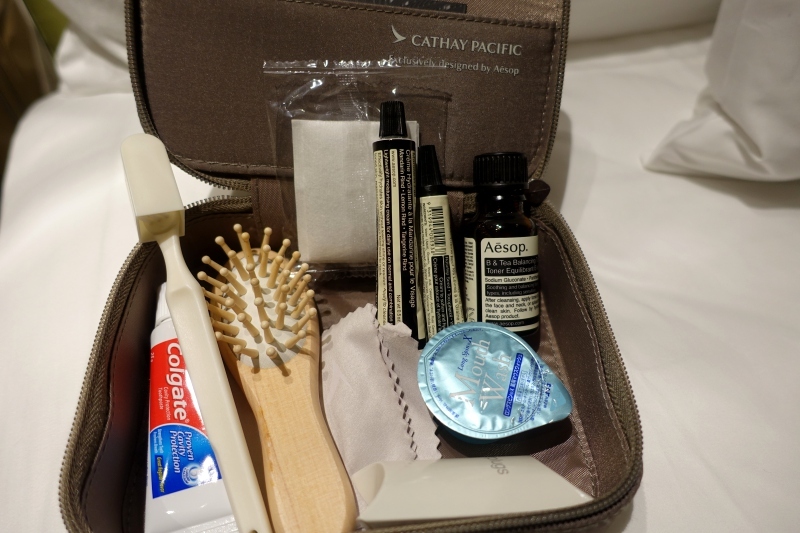 I do think Cathay has a winner in selecting and remaining with Aesop skincare products. I personally find the products more useful for hydration on these long flights than branded products such as Bulgari, and I've continued to use the Mandarin Facial Hydrating Creme after returning home to a cool, dry fall in NYC. In addition to the Hydrating Cream, the amenity kit including an Aesop toner, lip cream, ear plugs, dental kit, brush, lint cloth and tissues. 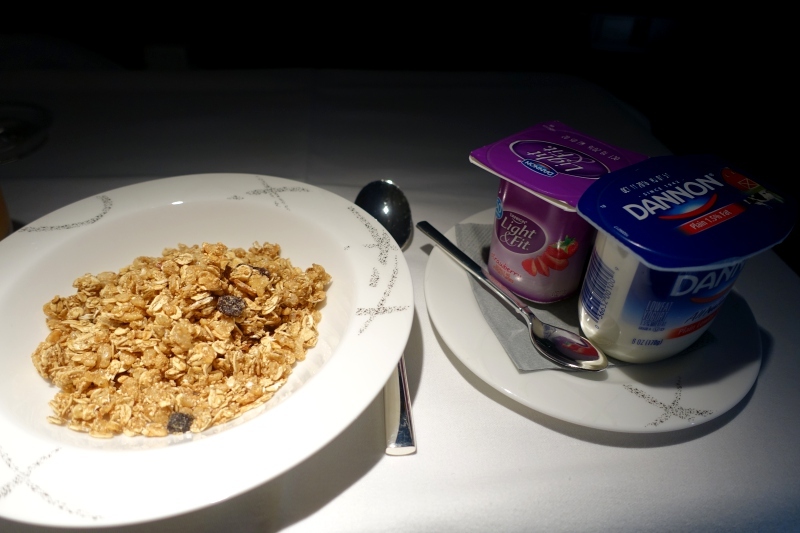 I was less a fan of the Dannon yogurt and sugary granola served–I really wish Cathay Pacific's catering in LAX would up its game and source some Noosa or organic Wallaby Greek yogurt, together with some Dorset Cereals muesli or granola. 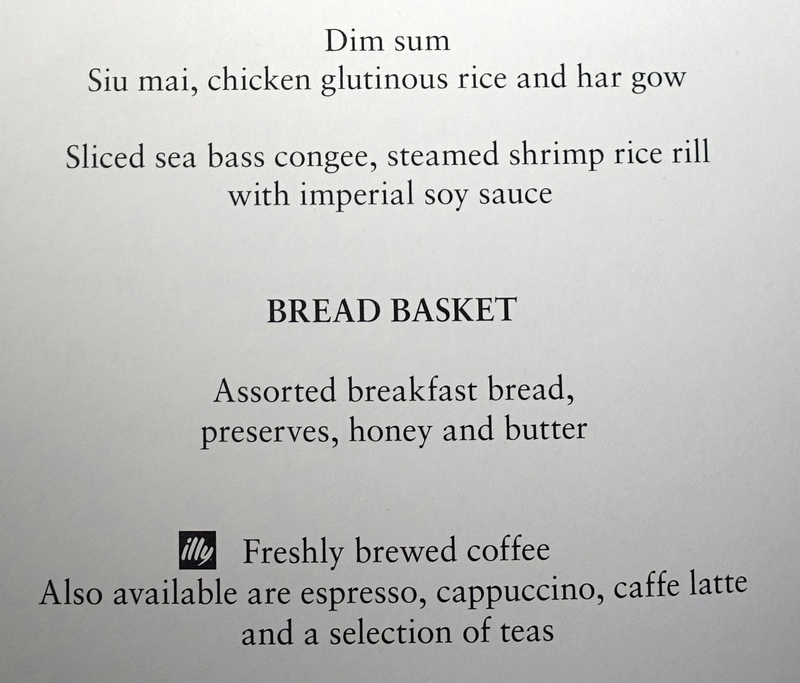 The other thing I always enjoy for breakfast in Cathay First Class is dim sum. 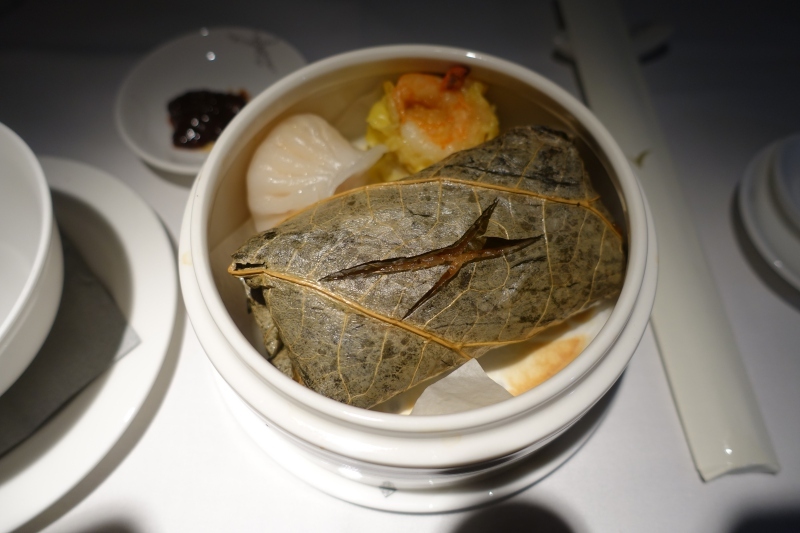 Yes, you can easily get better dim sum in Hong Kong or many Chinatowns, but it's still not a common offering in airline first class. 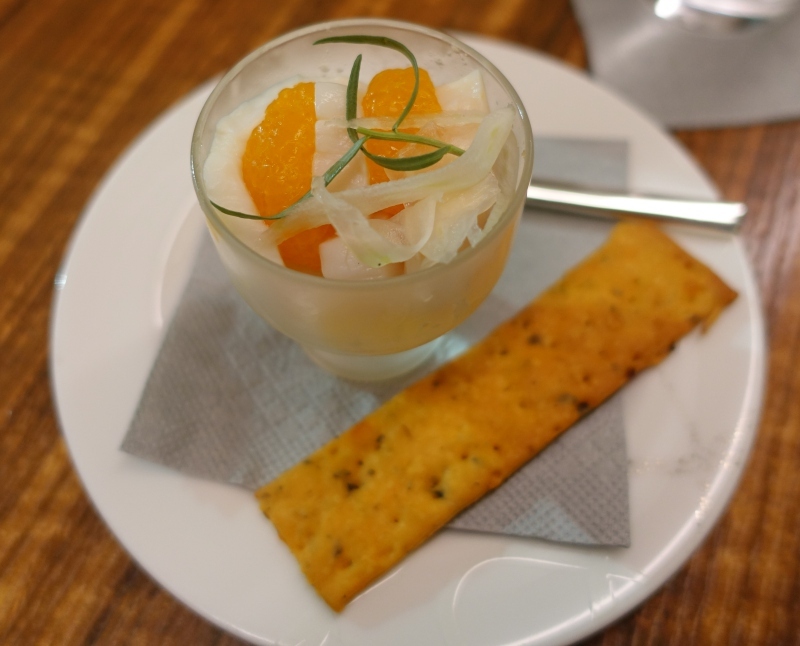 And the roasted chili sauce that you can request with it is great. 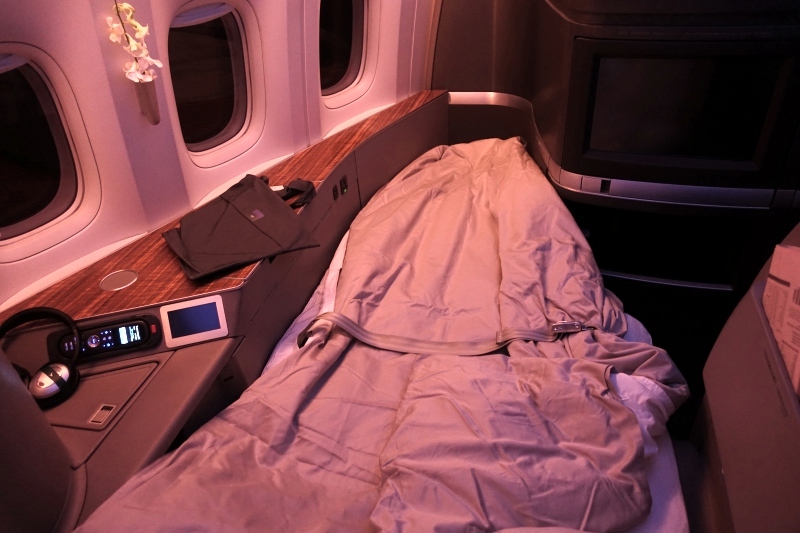 Cathay Pacific's First Class bed shines in the width of the head and shoulder area, thanks to the extra wide seat, and apparently linens are now 500 thread count. To be honest I didn't notice much greater comfort with the mattress pad, although it is apparently thicker than the one Cathay used to use. 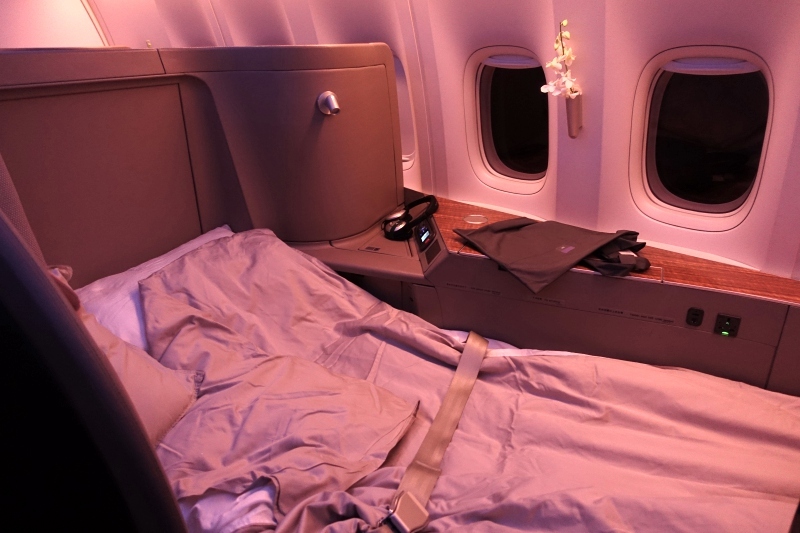 My favorite mattresses are the ones used in Singapore Suites and JAL First Class, but you can make the bed more comfortable by lying on top of the duvet (if the flight isn't full you may be able to use an additional duvet from one of the other seats). Even though it's not the most comfortable bed, with a sleep aid I was able to get around 5 hours of sleep and a couple more hours of rest, which is good for me. 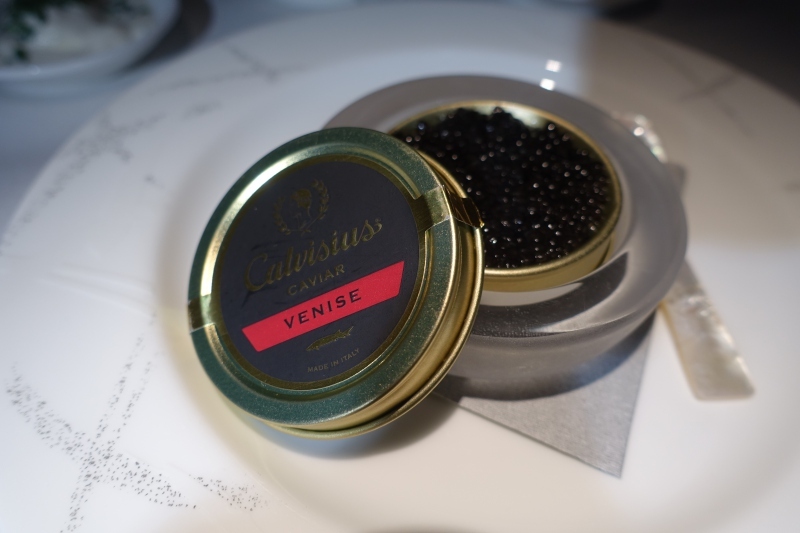 A highlight with Cathay Pacific, as with Singapore Airlines, is the in-flight entertainment. 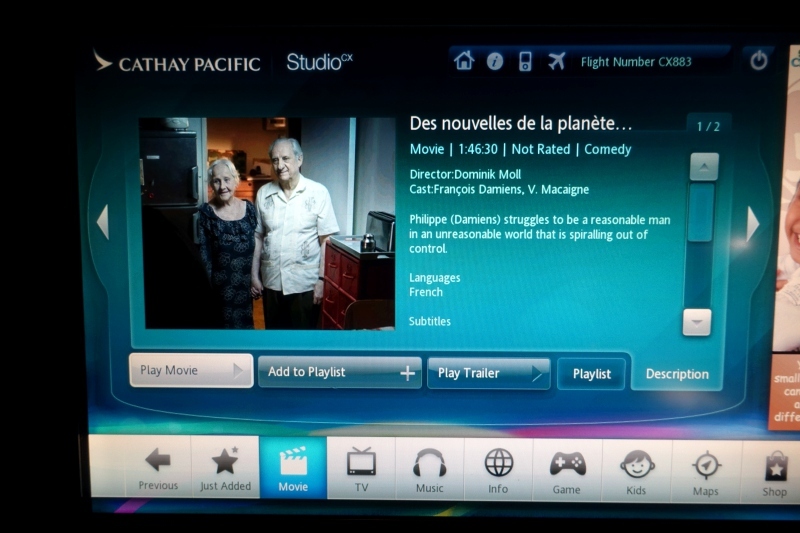 Singapore KrisWorld still wins in terms of its array of international movies, but most people who have broad ranging tastes will find something interesting to watch on Cathay Pacific's Studio CX system. Among the TV series I noticed The Night Manager, a high quality BBC production based on a John le Carre novel, and among the films, I eventually picked the oddball French comedy-drama “Des Nouvelles de la Planete Mars” (News from Planet Mars) which I enjoyed. 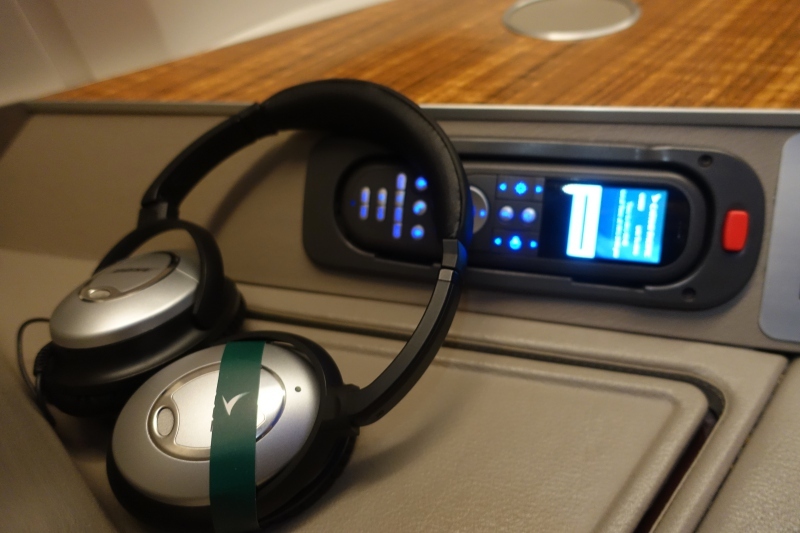 In Cathay First Class, Bose headsets are provided. 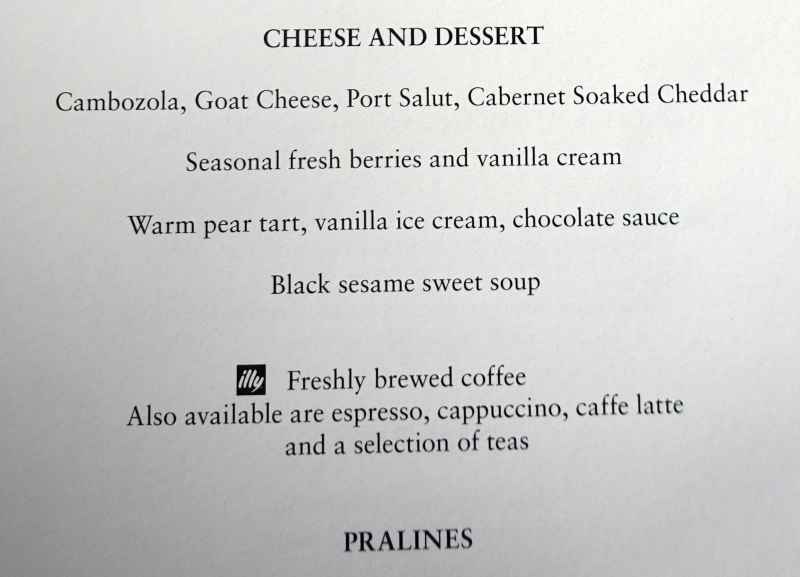 It's been a few years since I've flown Cathay Pacific First Class, and I enjoyed my night flight from LAX to Hong Kong, especially as I was able to sleep for several hours. 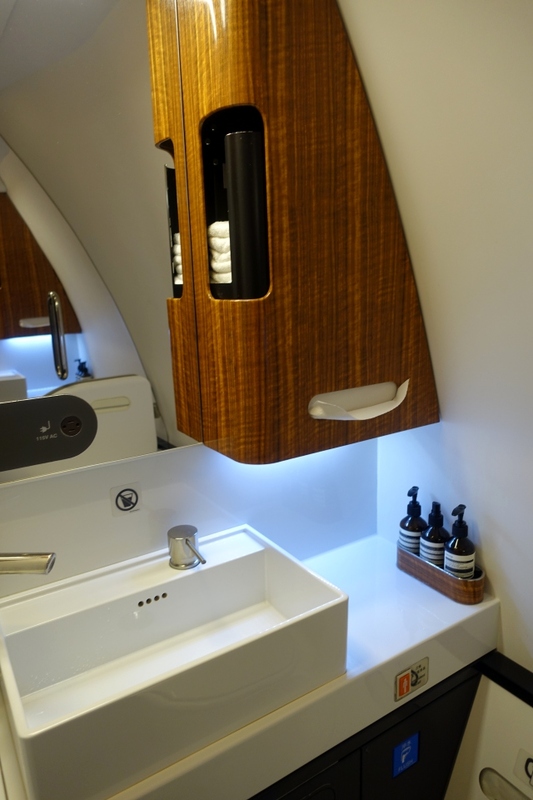 Highlights for me are the large and wide seat, more private first class cabin, with only 6 seats, polite and professional in-flight crew, Aesop amenity kit and Aesop products in the bathrooms, organic cotton pajamas, orchid by each seat, and Studio CX. 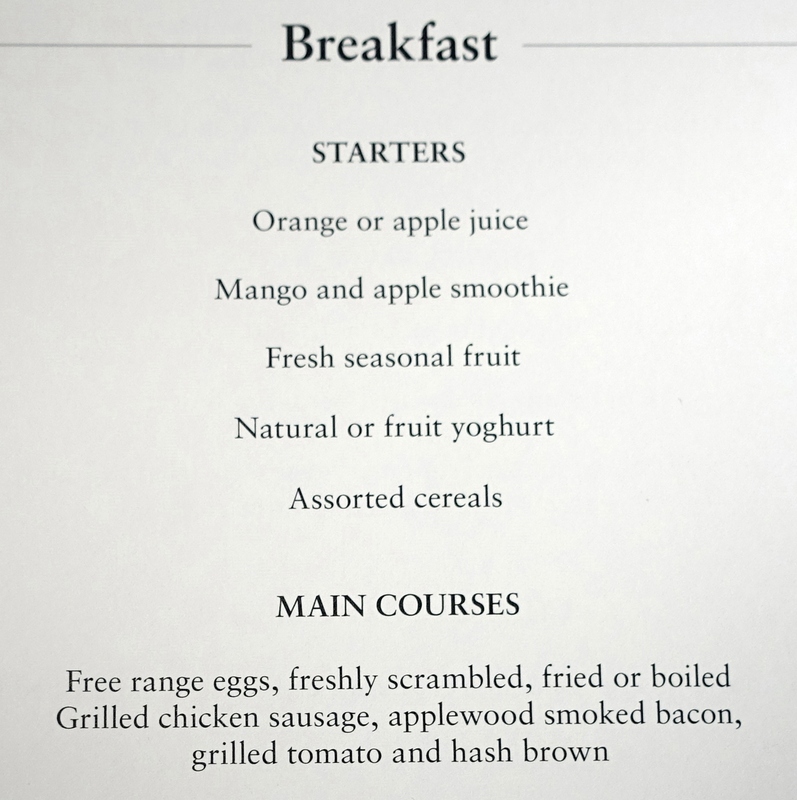 Things I'd love to see improved are the mattress pad and the food quality. 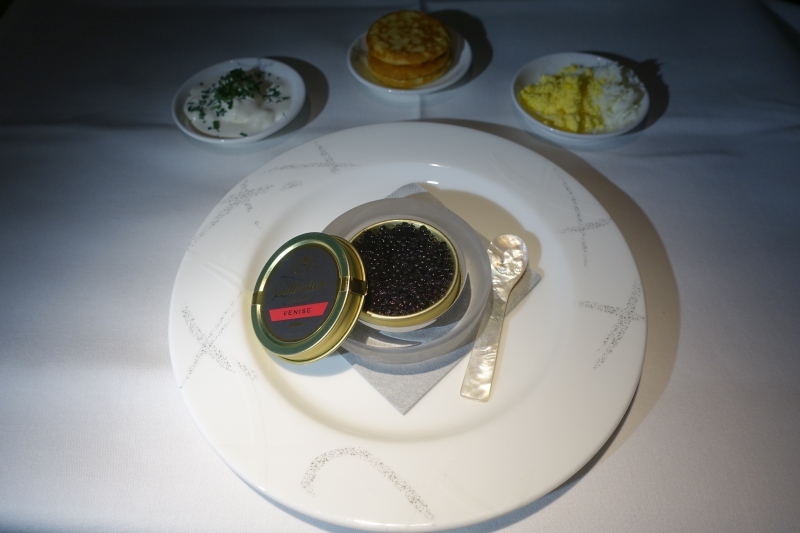 If you've flown Cathay Pacific First Class recently, what was your experience?